At a Presbyterian church in southern California, a shadow falls across the pastor's face as he reflects on his denomination. "Our worship styles are archaic and our belief systems are inflexible," he laments. "We are pushing people away." Down the street, a Methodist minister shares this concern. "People are spiritual but not necessarily religious. We've become such an institution that we forget about nurturing the spirit." In Illinois a Catholic sister worries that "the churches do not offer the deep nourishment people need; they're too superficial." Church members in New Jersey, New Mexico, and Ohio voice similar concerns about their denominations' ability to remain vital. "In the 1950s and '60s it was just accepted that you went to church," explains one. "But that no longer is the case." By all accounts, American religion should have suffered a serious decline during the last third of the twentieth century. Alternatives to organized religion—from cults and encounter groups to therapies and advice columnists—flourished. More people than ever were exposed to the influences of higher education so often presumed to erode traditional religious beliefs. Scientific research was funded at record levels. Longer life expectancies permitted people to focus on the here and now instead of the hereafter. Millions of baby boomers, reared on television rather than the Ten Commandments, came of age. Even the much publicized moral crusades of Jerry Falwell and Pat Robertson drew more negative reactions than public support. Of course, it was apparent enough to anyone who may have stopped to ponder the matter that Americans could move contentedly into the future, half-heartedly embracing a religion that provided neither cosmic values nor compelling explanations. Will Herberg, writing at the peak of America's postwar religious revival in the 1950s, had observed that religious sentiments were relatively superficial, despite their apparent universality.2 Americans always had been able to reconcile their churchgoing with schemes and ambitions hardly fitting for truer believers. The churches' ability to sustain themselves on sheer inertia, however, seemed more doubtful. The tacit assumptions on which churchgoing was predicated were clearly in danger of unraveling. Finding community among fellow congregants was likely to be less attractive to Americans who could effortlessly stay in touch with friends and family by other means. Messages about God could readily be heard on television instead of having to attend one's house of worship. If families that prayed together might, as advertisements suggested, stay together, churchgoing easily could cease to be attractive to the many Americans whose marriages had already failed. The mental jostling that millions of younger Americans experienced when they attended colleges and universities seemed especially likely to unsettle the conventional wisdom offered in pulpits and pews. Yet the striking feature of American religion during the last decades of the twentieth century was its remarkable stability. Large numbers of people continued to affiliate with churches and synagogues and to overwhelmingly express belief in God. Their proclivity to participate in religious services was undiminished. The religious voice in public life continued to be heard, and faith communities played a large role in the nation's philanthropic and service efforts. In a marked turnaround of scholarly and journalistic thought, virtually every observer of American religion became more impressed by its persistence than by signs of its erosion or impending collapse. Such evidence may be sufficiently rough to raise doubts about its ability to pick up increases or decreases in religious involvement. That concern, however, is diminished by the fact that surveys did capture earlier increases and decreases. During the 1950s, for instance, when Cold War fears and family concerns resulted in a widely discussed "revival" of religious membership and new church construction, churchgoing figures in Gallup surveys hit all-time highs. Later, when countercultural unrest and fallout from the Second Vatican Council were thought to have a negative impact on established religion, churchgoing (especially among Roman Catholics) fell according to several surveys taken at the time. My reason for pointing to this stability in American religion is not to take sides in old debates about secularization or to defend the accuracy of social survey results.10 Rather, I wish to point out that the relative persistence of religious commitment during the last part of the twentieth century poses an interesting puzzle. Why did it persist, especially when so many features of the period would suggest otherwise? Furthermore, what can be learned about the vitality of American religion during this period that might be helpful for those who wish to nurture this vitality in the future? The last third of the twentieth century was a time of momentous social change. Although no major wars and no serious economic crises occurred, several quiet social developments took place that resulted in profound changes in nearly all sectors of American society. In the economy, one of the most notable changes was the large proportion of women who joined the paid labor force. In the family, social change was especially evident in the rising divorce rate. In community life, neighborhoods became increasingly anonymous as a result of population growth and geographic mobility. In education, the number of young Americans attending colleges and universities hugely increased. The potential for each of these developments to have had negative consequences for religion can be seen from a brief review of the evidence. The proportion of women participating in the labor force grew from just under 43 percent in 1970 to just under 62 percent in 1999. The largest changes were among women between the ages of twenty-five and forty-four: eight in ten were employed by the latter date, compared with approximately half in 1970.11 A large number of these women were married mothers of school-age children. Besides participating in the labor force in larger numbers, women also devoted longer hours to their jobs. According to one estimate, annual hours of paid employment for women in the labor force grew by an average of 305 hours between 1969 and 1987.12 Part of this increase was due to women working more overtime hours and spending more weeks per year at the job. It was also the result of women opting for full-time instead of part-time employment: between 1973 and 1998, the proportion of working women with part-time jobs shrank from one in three to one in five.13 The reason that this trend had potentially negative implications for religion was that women (especially married women with children) had been the most active participants in churches and synagogues. Compared to men, they had shouldered a large share of church responsibilities requiring volunteer time. Yet, as their free time diminished, their likelihood of participating in religious activities did too. Thus, among women surveyed in 1999, 64 percent who worked fewer than ten hours a week attended religious services every week, but this proportion dropped to 50 percent among those who worked between ten and nineteen hours a week, to 30 percent among those who worked between thirty and forty-nine hours, and to only 9 percent among those who worked more than sixty hours.14 In short, the more hours a woman worked, the less likely she was to attend religious services. The rising divorce rate was another factor with potentially negative consequences for religion. The change in this rate was associated with the greater economic independence achieved by women through their participation in the labor force, with unsettled social conditions, and with altered understandings of marriage. Despite the fact that most Americans continued to value marriage, the divorce rate rose from approximately one divorce for every four marriages in 1950 to one for every two marriages in the 1990s. As a result, the proportion of divorced Americans in the 1990s was about four times as high as it was in 1960.15 The reason that this trend did not bode well for religion is that married men and women attend church at higher rates than divorced or separated people do. For instance, in 1999, 40 percent of married adults claimed to attend religious services every week, compared to only 24 percent among divorced adults and 17 percent among separated adults. Although many people who divorce remarry within a few years, they continue to attend church less frequently than do married people who have never been divorced (31 percent attend weekly, compared to 41 percent among the latter).16 As the proportion of divorced people in the population increased, therefore, the likelihood of people attending religious services should have decreased. Even if the nation's churches were particularly clever at staving off the ill effects of these trends, their success is all the more impressive in view of the fact that so many other community organizations suffered. As Robert Putnam has shown, the quarter-century after 1970 witnessed serious losses in the memberships of a wide range of community organizations, including such prominent groups as the PTA, Elks, Moose, veterans' organizations, labor unions, and scouting.23 Why the churches fared as well as they did is a puzzle. What could account for this stability? Or, in view of the social trends affecting religion negatively, what else might be contributing enough to the churches' vitality to make up for these losses? A possible answer is that there is simply some inveterate human need for religion, perhaps to cope with our fear of death or to express our faith that someone is in control. This answer has the virtue of explaining a constant with a constant: if religious commitment has not changed, it may be because the need for religion has not changed. This explanation falters, however, in view of the evidence that religious commitment is not constant. It varies from society to society; it rose in the 1950s and declined in the 1960s; and it is different among people with various levels of exposure to the labor force, marital instability, neighborhood ties, and higher education. Indeed, the fact that so many trends have been working against religion suggests that something else must be working in its favor. People do not flock to churches only because they feel a need for religion; something about religious organizations has to attract them. There is a difficulty with this explanation, though. If recent immigration is a source of new vitality in American religion, persons of foreign birth should be more actively involved in their places of worship than are native-born Americans. Anecdotal evidence from case studies of new immigrant congregations suggests that persons of foreign birth are more involved.25 When systematic national evidence is examined, however, these people are on the whole less involved: 28 percent attend services every week, compared with 34 percent of native-born Americans.26 The pluralism argument also founders on the fact that competition among religious groups has decreased significantly, as is evident in rising rates of interfaith marriages, greater tolerance toward members of other religions, more ecumenical programs, and denominational mergers. There are, in fact, three widely held theories of religious vitality, each of which has been put forward to suggest what religious leaders should do, in addition to providing an account of why religious commitment may be holding its own. One has emphasized the special advantages of conservative churches; a second focuses on entrepreneurial church leadership; and the third focuses on the merits of religious groups posing as an embattled subculture. The argument about conservative churches was first advanced by Dean M. Kelley in Why Conservative Churches Are Growing.28 Writing in the early 1970s, Kelley noticed that conservative denominations such as the Southern Baptist Convention and the Assemblies of God were gaining members, whereas theologically moderate or liberal denominations such as Episcopalians and Methodists were declining. Kelley advanced the provocative thesis that conservatism was attractive because it demanded more from members and thus gave them a clearer sense of their religious identity. The argument was all the more compelling because Kelley himself was affiliated with one of the liberal denominations and because theories of secularization generally had painted a gloomier picture for conservative groups than for denominations more in tune with the times. The idea about embattled subcultures was put forth more recently by sociologist Christian Smith in a national study of American evangelicalism.32 Extending the work of Kelley, Smith argued that there are special advantages to religious groups that effectively identify themselves as beleaguered minorities, or what historian Laurence Moore has termed "religious outsiders. "33 Evangelicalism grew during the last half of the twentieth century, Smith suggested, because its members regarded themselves as marginal to mainstream culture, even though many of them were not as different in their beliefs and lifestyles as they liked to think. Waging symbolic battles over the role of religion in politics was one way in which evangelicals maintained their distinct identity in the 1980s and early 1990s. Other ways included home-schooling their children or sending them to church-sponsored schools, and criticizing the moral messages presented by the mass media. Each of these arguments was grounded in empirical research and suggested a practical way not only of explaining religious vitality but also of promoting it. If these arguments are valid, they suggest that the persistence of religious commitment over the past several decades may be largely attributable to religious conservatism, entrepreneurial nondenominational congregations, or evangelicals. For those wishing to nurture religious vitality in the future, the implication of these arguments is that the best way to proceed is to promote religious conservatism, build nondenominational churches, or encourage people to become evangelicals. Unfortunately, none of these three approaches now appears quite as persuasive as it initially seemed. The notion that churches could be revitalized by turning more people into religious conservatives also seemed less appealing by the 1990s than it may have seemed in the 1970s. Through the aggressive preaching of Jerry Falwell, Pat Robertson, and thousands of less-visible fundamentalist pastors, major efforts were initiated in the early 1980s to enlarge the number of religious conservatives. Yet, when surveys were taken, little lasting change in the proportion of religious conservatives in the population at large was evident. Between 1984 and 1989, the proportion of self-identified religious conservatives did increase (from 19 percent to 26 percent), but so did the proportion of religious liberals (from 19 percent to 23 percent). Both extremes grew because the public became more polarized (fewer opted for a middle position and fewer refused to identify with any of these labels). A decade later, in 1999, no further growth in the number of conservatives was evident (26 percent selected that identity), whereas the proportion of religious liberals had grown (from 23 percent to 28 percent).35 As a political force, religious conservatives did succeed in gaining considerable influence within the Republican party; and yet it was hard to make the case that this influence translated into greater vitality for the churches at large. The main difficulty with these arguments, however, is not that they are weakened by careful consideration of empirical data but that they offer limited options for the revitalization of American religion. To suggest that revitalization can come about mainly through more conservatism, more independent megachurches, or more evangelicalism is limiting because all three suggestions focus on one segment of American Protestantism. They offer little for the revitalization of the Catholic church and are unlikely to appeal to many liberal or mainline Protestants. For the wider society, it is questionable too whether the kind of Protestantism that has been associated historically with fundamentalism and rigid moral crusades may be the most attractive religious option in an increasingly pluralistic world. The puzzle remains, then, of what might be contributing to the recent vitality of religious commitment and what practical insights may be gained for those interested in revitalizing the nation's religious institutions. When confronted with a conundrum of this nature, it is wise to reconsider one's assumptions. In the present case, virtually all thinking about religious trends among social scientists has been influenced by a conventional wisdom—theories of secularization—that emerged in the nineteenth century and gradually came to be accepted during the twentieth century. The three arguments just considered were intriguing to social scientists because they challenged these dominant understandings of secularization. These arguments did so, however, by pointing out anomalies, rather than by paying close attention to the assumptions of secularization theory itself. Although there are conflicting interpretations, one of the core assumptions of secularization theory is that religion gradually loses influence as its traditional functions come to be performed by other specialized institutions.39 This process of institutional differentiation, as it is called, is illustrated by the separation of church and state prescribed by the First Amendment of the U.S. Constitution. This amendment, in effect, guarantees that governance of the nation will be performed by political agencies rather than by churches. It contrasts with theocratic forms of government in which religious leaders rule. Other, more recent examples of religion losing influence in this manner include the emergence of specialized social relief agencies at the end of the nineteenth century, which replaced some of the voluntary service activities of churches, and the rise of professional counseling toward the middle of the twentieth century, which created a sharper distinction between therapy and pastoral advice. The key argument that grew out of this line of reasoning was that by the latter half of the twentieth century religion in America was becoming increasingly privatized.40 Rather than influencing politics or business, as it had done in the past, it was now part of the domestic sphere in which people pursued their private interests. It dealt more with personal than with public morality and was concerned with marital happiness and child rearing, rather than decisions made in corporate boardrooms or legislative halls. The private sphere was the natural place for religion to retreat because this sphere was shielded from government regulations. Individuals could make up their own minds about religion and pursue religion at their leisure. The idea of privatization provided an explanation for religion's apparent retreat from such realms as politics, medicine, science, higher education, and business. While it suggested that people might remain interested in religion temporarily, it also gave rise to speculation that even within the private realm religion would decline as more of its functions were taken over by other institutions. For example, the growth of professional counseling was regarded as evidence of religion succumbing to a therapeutic motif; similarly, the spread of entertainment technologies was viewed as a serious threat to the leisure time in which religious activities were performed. In retrospect, the error lay in regarding privatization as a symptom of overwhelming and ever-expanding pressures on religion from larger and more powerful external influences. In this view, religion shrinks into the private realm and then continues to decline. Once this view is taken, the only way to explain religious vitality is to look for groups that successfully resist these external influences—groups such as religious conservatives, megachurches, and evangelicals. It becomes difficult to explain why religious commitment in the wider population might persist or to find other sources of religious vitality. There is, however, a different way to think about privatization. This view emphasizes what might be called selective absorption. It suggests that religious organizations do not respond passively to social conditions but negotiate with their environment. They do so by identifying new opportunities in their surroundings and developing programs to take advantage of these opportunities. One might think of a pastor strategically determining where best to deploy the resources of his or her congregation. Some niches in the wider community will seem more opportune than others. Multiply these decisions by all the congregations in the country and it becomes possible to imagine how religion strategically adapts to available opportunities. The process of privatization that scholars wrote about in the 1960s can be understood in this way. At that time, the majority of the nation's families were raising children (the children who were to become known as the baby boom generation). Leisure time was expanding, and the general affluence of the period gave most middle-class families an opportunity to develop their leisure interests as they wished. The private sphere was not so much a last frontier for religion as a new or expanding frontier. Churches deployed resources in this direction because family and leisure concerns provided an attractive opportunity. To say that religion engages in selective absorption is to suggest that it tries to take or incorporate activities that are being done by other organizations but perhaps being done badly or at levels below public demand. The relationship between religion and therapy can be viewed as an example: the mental-health movement of the 1950s aroused public awareness of so-called psychological problems, opening new opportunities for both secular therapy and pastoral counseling. 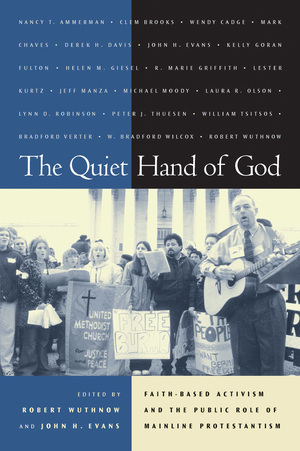 Another example is the resurgence of interest in faith-based social-service provision during the 1990s as part of the welfare reform legislation of 1996: public frustration with government welfare programs, combined with a coalition of moderate Democrats and conservative Republicans, resulted in opportunities for churches to play a larger and more widely subsidized role in service provision. These examples suggest that there may be at least three conditions necessary for selective absorption to be pursued effectively. The first is a real or perceived need or interest on the part of some large segment of the population. The second is some precedent that gives religious leaders a legitimate claim to being able to meet this need. And the third is some weakness on the part of competing contenders for filling the need. In the case of faith-based service provision, for instance, there was a widespread perception that something should be done to help the needy and that volunteering was desirable. Religious organizations had a long history of caring for the needy and were already doing a great deal to encourage volunteering; thus, there was little question about the legitimacy of their involvement. There was also a conviction that government-run programs were not entirely satisfactory. In this view, the most plausible candidate for explaining the religious vitality of the last years of the twentieth century more generally is what many observers identified as a significant and broad-based upsurge of interest in spirituality. It was in these years that growing numbers of people began to talk about spirituality and, indeed, to think about it as a pursuit, as something to be cultivated, sought, practiced, rather than as a condition of birth or family inheritance. Religious organizations were in business to meet the needs of people interested in spirituality. If this interest was growing, it offered religious organizations opportunities to develop new programs and, in turn, to generate involvement in these programs. The only problem with this explanation is that interest in spirituality has been widely regarded as happening outside of religious organizations. Baby boomers especially seemed to hold established religion in disrepute, preferring instead to seek spirituality in their own ways.41 The mass media provided more interesting ideas about the sacred than the churches did. People flocked to gurus and spiritual consultants, read their horoscopes, prayed to crystals, and read fiction thrillers about spiritual warfare. But suppose that this view of spirituality were wrong. Suppose that the more colorful, esoteric expressions of spirituality captured media attention simply because they were colorful and esoteric, while most of the public's interest in spirituality was being absorbed by organized religion. Or suppose, at least, that most people who developed a serious interest in spirituality wound up pursuing that interest through religious organizations. In that case, identifying what might be encouraging interest in spirituality in the wider society becomes crucial to understanding the persistence and vitality of organized religion. Spirituality, like religion, cannot be understood simply by positing some intrinsic human need for it. To be sure, the quest to know God may arise from existential yearnings, from illness and loneliness, or from moments of wonder about the ultimate mysteries of life. But these vague yearnings and experiences have to take shape. They have to find carriers, vehicles of expression to help people to make sense of their feelings, to become more aware of them, to talk about them, and to realize that other people are having similar feelings. Carriers are the key. They have to be readily available throughout the society. They have to serve as media of expression and communication, linking private experience with public life, and, in the present context, they have to be understood as legitimate ways in which to think about spirituality and to pursue it. Are the Arts a Factor? On closer consideration, however, the arts may be more conducive to spirituality than at first imagined. In fact, one of the most important reasons that spirituality seems so pervasive in American culture is the publicity it receives because of its presence in the arts. Consider the spiritual themes running through such popular songs as Bette Midler's "Rose," Amy Grant's "Raining on the Inside," Madonna's "Like a Prayer," Whitney Houston's "When You Believe," or Celine Dion's holiday album These Are Special Times. Music lovers' taste for spirituality has helped such albums as Andrea Bocelli's Sacred Arias, the Benedictine monks of Santo Domingo de Silos's Chant, and selections from the music of twelfth-century mystic Hildegard von Bingen climb to the top of popular charts, while the works of less widely known composers such as Morten Lauridsen, John Tavener, and Arvo Pärt have also gained substantial audiences. Music's connection with spirituality is rivaled only by that of television and film. The millions of Americans who watched Highway to Heaven in the 1980s turned up in larger numbers in the 1990s for Touched by an Angel. Box-office hits with thinly veiled religious themes, such as The Lion King and the various Star Wars episodes, were accompanied by films with explicit religious content, such as Mission, Apostle, and The Prince of Egypt. Even painting, sculpture, and other museum exhibits offer the public ample ways of connecting to the sacred. Visitors to the Cleveland Art Museum could view an exhibit of "Vatican Treasures"; in Louisville, they could attend the "Festival of Faiths" at the Cathedral Heritage Foundation; they could view the "Negotiating Rapture" exhibit of postwar artists interested in mysticism at the Museum of Contemporary Art in Chicago; or, in Washington, D.C., they could visit a Smithsonian exhibit about African American spirituality. Besides articles about these and other exhibits in newspapers and magazines, the role of the sacred in visual art is a prominent focus of such newly founded specialty periodicals as Image, Christianity and the Arts, and Religion and the Arts. "A quiet renaissance is occurring in pockets of the art world," writes one observer. "In place of the modernists' battle cry 'art for art's sake,' other voices are rising that speak of art and music as expressions of . . . spirituality. "45 Certainly these many examples of spirituality in the arts could be considered carriers: vehicles that helped the American public to become more aware of its interest in spirituality and to find legitimate ways of expressing this interest. It is also worth noting that institutional arrangements are creating opportunities for religion to capitalize on whatever interests in spirituality the arts may reinforce. Both the democratization of art and the erosion of rigid boundaries between sacred and secular space have played a part. Through the mass media, and through deliberate efforts by arts organizations to expand their audiences, the arts are more readily available to a large majority of the public than ever before. At the same time, many religious organizations are working more cooperatively with arts organizations than in the past. At a church in Brooklyn local artists have found an inexpensive venue for their performances and exhibits. In Philadelphia, community-arts-council leaders have been working with churches to provide educational opportunities for children from low-income families. Major galleries, such as the Dallas Museum of Art and the San Francisco Museum of Modern Art, have initiated cooperative programs to draw wider audiences from community groups, including churches. For their part, churches increasingly have been experimenting with art festivals and craft fairs, artist-in-residence programs, and concert series, while large congregations sometimes have been able to sponsor entire orchestras and touring musical companies. The idea of selective absorption suggests that religious organizations may be able to generate commitment when there are new or unmet interests in the wider public, when religion has some precedent for staking claim to these interests, and when competitors may be vulnerable or at a disadvantage. As it happens, there is widespread and, as evidence will suggest, growing public interest in the arts. This interest ranges from attending gallery exhibits and concerts to singing in choirs, listening to compact discs, taking art classes, and writing poetry. Much of it has been encouraged by more abundant music and art programs in the schools, and many Americans have enjoyed incomes and leisure time sufficient to provide opportunities for them and their children to pursue artistic interests. Although religion and the arts have sometimes been at odds with each other, religion has a long history of patronizing certain kinds of artistic activities, and there are reasons to believe the boundaries separating the two may be weakening. Some churches have eagerly incorporated contemporary music into their worship services, while others have experimented with liturgical dance and the visual arts. Moreover, the arts are relatively decentralized organizationally and professionally, meaning that some artistic interests may be easily absorbed by other institutions. In comparison with medicine and law, for example, some expressions of the arts can be absorbed by religion because there is no central certifying agency and the line between avocational and professional interests is less clear. In the wider public, most artistic interests are pursued privately and for personal reasons, and this allows interest in the arts to emerge during quiet times when prayer, meditation, or reflection about one's values occur. The argument I want to consider is not that the arts are the only influence generating interest in spirituality, but that they are a significant one. This influence is evident in the fact that many religious organizations are already developing innovative ways to make greater use of the arts. This is not to suggest that formal alliances between religious and artistic organizations are primarily how these links are being forged (although such alliances are increasingly common). The connections between spirituality and artistic interests are, for the most part, taking place among ordinary people. In many cases, a childhood interest in spirituality is later encouraged by learning a form of artistic expression; in others, early participation in the arts leads to a later interest in spirituality. The connections are by no means inevitable; yet spirituality has taken on particular meanings in recent years that make it especially amenable to exploration and encouragement through the arts. As people pursue their artistic interests, their attraction to certain expressions of spirituality increases, and this interest, in turn, promotes involvement in faith communities. On the surface, it is perhaps far-fetched to propose that the vitality of America's churches may depend significantly on the public's growing interest in artistic activities. If this argument is true, however, it holds wide-ranging implications for religious leaders and for the ways in which they go about promoting spiritual growth. To determine whether this argument has merit, we must turn first to a closer consideration of the public's interest in spirituality. Robert Wuthnow and John H. Evans bring together a stellar collection of essays that paints a contemporary portrait of American Protestantism—a denomination that has remained quietly, but firmly, influential in the public sphere. Mainline Protestants may have steered clear of the controversial, attention-grabbing tactics of the Religious Right, but they remain culturally influential and continue to impact American society through political action and the provision of social services. The contributors to this volume address religion's larger role in society and cover such topics as welfare, ecology, family, civil rights, and homosexuality. Pioneering, timely, and meticulously researched, The Quiet Hand of God will be an essential reference to the dynamics of American religion well into the twenty-first century. Robert Wuthnow is Professor of Sociology at Princeton University. His most recent books are Creative Spirituality: The Way of the Artist (California, 2001), Growing Up Religious (1999), After Heaven (California, 1998), and Loose Connections (1998). John H. Evans is Assistant Professor of Sociology at the University of California, San Diego. He is the author of Playing God? Human Genetic Engineering and the Rationalization of Public Bioethical Debate (2002).